Flicking through the The Priest, the newspaper for the National Conference of Priests which all English and Welsh priests received this week, I found an advert for a new book, A Celebration of the Martyrs in Stained Glass. 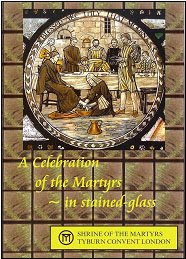 It reproduces and explains the beautiful windows designed by Miss Margaret Rope for the crypt of Tyburn Convent, depicting the English Martyrs in the context of the Beatitudes and the Corporal Works of Mercy. Miss Rope is well known to alumni of the Venerable English College, Rome, for she also designed a window of St Ralph Sherwin that is on the College's staircase and her brother was the late, great Fr H.E.G.Rope, M.A., priest, poet, historian and Luddite (!). Anyway, I've just found an informative website about Miss Rope (and her cousin, the other Miss Rope - also an artist), which you can find here. The book is available from The Bursar General, Tyburn Convent, 8 Hyde Park Place, London W2 2LJ for £10.80 postage and packing included. I never cease to be amazed by the women artists of the Arts & Crafts Movement - and by the remarkable flowering of religious art in that period. Many thanks for drawing this to our attention. But, Jackie, think of all the wisdom that your years undoubtedly give you! Oh OK if you're sure! I just wanted to wish you a Blessed Christmas! I absolutely love your blog!. Keep up the excellent work. Thanks for the link to my site on the two Margaret Rope's. I would be very grateful if anyone could supply a photo of the window by Margaret Rope at the Venerable English College. I have seen the cartoon for the window, which resides at St Michael's, Kesgrave, Ipswich. Incidentally, I am currently researching Ellen Mary Rope, aunt of Margaret senior and Harry (Fr. H E G Rope) and would be glad of any references to her work too, as a sculptor.